When you hear the word Watts, what comes to mind? Serious question. What’s the first thing you think of? I’ll give you a moment to filter your thoughts because I’ll be honest – I definitely filtered mine. Here’s what didn’t come to mind – ART. Not just art, how about – home to a National Historic Landmark? 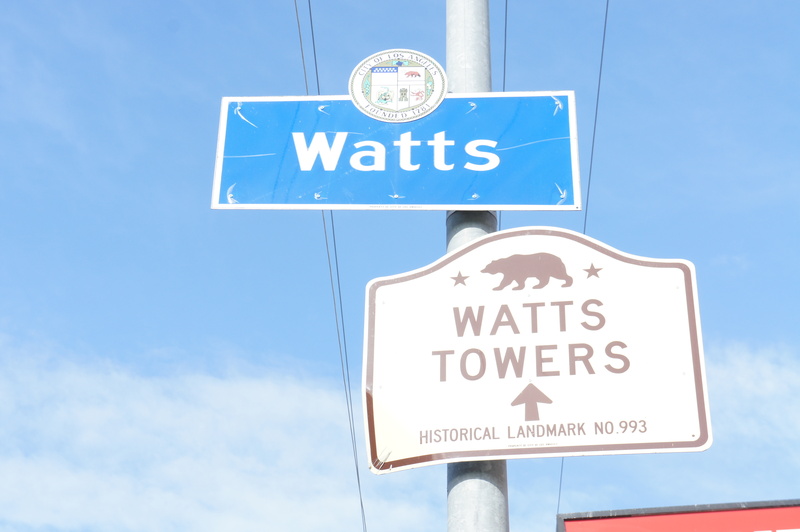 Yes, the city of Watts has a monument recognized for its ingenuity and the vision of one man. Since I love art, I had to make my way to the Watts Towers and I wasn’t alone. On this particular day, a crowd gathered to admire a piece of Los Angeles history. 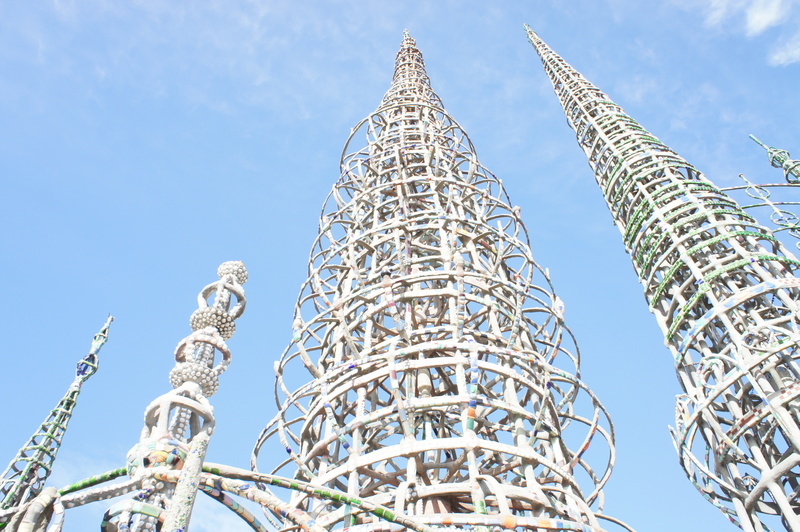 Located just east of the 110 freeway, the city of Watts is known more for the three-day riots of 1965 than for the Simon Rodia creation, which has stood in the same spot for over 60 years. Think about this for a second – he built it by hand using no plans, machinery, scaffolds or designs. Nuestro Pueblo as he called it, was his commitment to building something “big.” That’s all he wanted to do. Can you imagine? My idea of building something big is a website and blog. A construction worker by day, Simon emigrated from Italy to the United States in 1895. After a brief period on the east coast, he settled in Watts, bought a plot of land, and started creating his 34-year project. Do you think he thought it would take that long? Do you think he cared how long it took? My guess is no. My guess is that he always looked at his creation as incomplete. The biggest challenge for an artist is determining the completion of the art. The towers are constructed from many raw materials including ceramic tiles, broken glass, seashells and generic pottery. Picture this: 17 structures all connected with the two tallest towers standing 99 feet. He also managed to create the longest slender reinforced concrete column in the world. After a fresh batch of rain, the neighborhood surrounding the tower was still. Only those of us there to marvel at the structure could be seen or heard. The crowd that gathered on this day was indeed a motley crew: photographers, writers, a group of Germans and another group on a guided tour. Tours are conducted seven days a week with children under 12 admitted free. The fee for adults is 7.00 dollars. Reportedly a recluse, Simon didn’t endear himself to his neighbors who vandalized his creation repeatedly. He eventually moved away, leaving his creation in disgust of his neighbors who failed to appreciate his work. He died 10 years later. A community that included local artists, activists and architects saved the monument from destruction in 1959. By this time, the structure was known around the world. The monument is now run by the Los Angeles Cultural Affairs Department in partnership with LACMA. After the city took responsibility of the towers, an engineering test was performed to determine the safety of the materials used to construct it. Amazingly, cranes with cables attached were unable to move or bend any part of the structure. He created this with his bare hands! Simon Rodia reminds me of my father. I imagine he probably never took a day off. He probably never called in sick and he probably never knew how talented he was. Unbelievable. Ingenious. Extraordinary. Remarkable. Historic. All, right here – right here in Watts.